Your cracks are no match for our exterior foundation waterproofing & restoration services.We are experts in foundation wall hand dug to footing. From Hydrostatic pressure relief system (French drains), construction waterproofing, flooding window wells, dry wells, property drainage, and sump pumps we got you covered! From newer to older structures which are commonly found in Queens and the boroughs, we can handle it. We provide you with an immediate free inspection, examination, and estimate. We are commercial & residential experts. Our scaffolding solutions allow us to service your buildings no matter what the size. We are fully licensed & insured. Are work is 100% on time and guaranteed. Our waterproofing experts & service men are dispatched from queens and will be at your place in minutes. Call 718-690-1361 for a fast & free estimate. 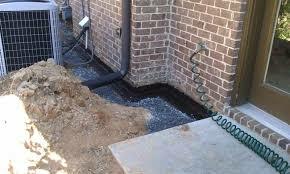 In addition to these contracting services we also provide roofing repair for your home or business.